Confessions of a Frazzled Teacher: All About Sight Words - What Are They, Which One to Use, and How Do I Track Student Progress? 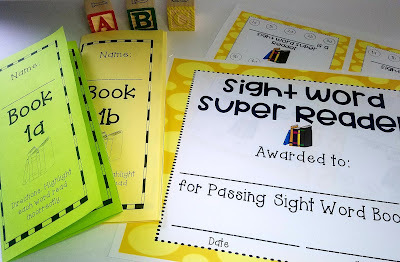 All About Sight Words - What Are They, Which One to Use, and How Do I Track Student Progress? I believe phonemic awareness and phonics skills are an important skill and I teach them to my students. However, up to 90% of words in a typical book are found on the Fry Word List and of these, the majority are in the Dolch list. I'm getting ahead of myself though. There are many different word lists with sight words. Each one claims their list is the most important. While I'm sure many lists are valid, there are two that are the most universally acknowledged. Fry Word List - This list is made up of 1,000 of the most frequently read words. It's listed in increments of 100, making it easy to focus on 100-200 per grade level K through 5th. Dolch Word List - The Dolch Words are made up of 220 words. These words are more targeted in being the highest volume of written words. Many schools use one of these two lists above or take a list from different publishers. First off, if your school mandates one particular list, you should follow that first and supplement as needed. If you are given the choice, think about your students' abilities. The Dolch list may be too easy/challenging for your students. Personally, I am a fan of the Fry list. I like that there is a larger selection of words for my students. Since I teach third grade, I have students that run the entire range of the list. I can target my lower level students with the more basic words while challenging my higher level students. Unfortunately in my district, we do not really have a universal system. At one point we did use Fry but that lasted only a year. I have tried many strategies over the years. I first kept an individual log and just wrote down the words as my students struggled with them. There was no real rhyme or reason as to how I kept track or helped my students master them. As the years progressed, I tried word lists that I assigned individual students to mastering. This worked a little better because I could focus on one list of 100 words. I would mark off where students left off. This worked for a couple of years before I realized I wanted more. Eventually I created an entire system for tracking my student's progress. For this I used individual booklets that my students work through earning certificates along the way. I store everything in expanding file folders which neatly contain all the work I need for the entire year. It has made individually teaching/reviewing sight words simple. If you are interested in seeing more, click on the picture below. 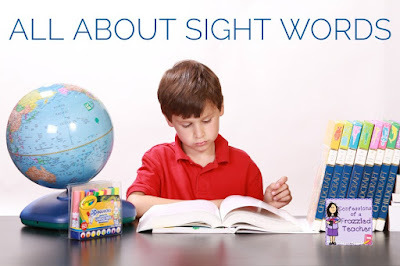 Do you teach Sight Words? Tell me all about it in the comments below!